Today in my A to Z trip through December, we are on I! To check out the earlier posts, click here! Aren't icicles beautiful? My sister gave me a set of old-fashioned metal icicles for my Christmas tree. When they catch the light, they sparkle. So beautiful. 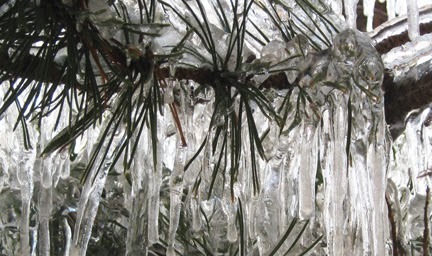 In nature, icicles are fascinating. I took at least a dozen photos when I found this tree coated in icicles. What do you think is the most beautiful part of winter? 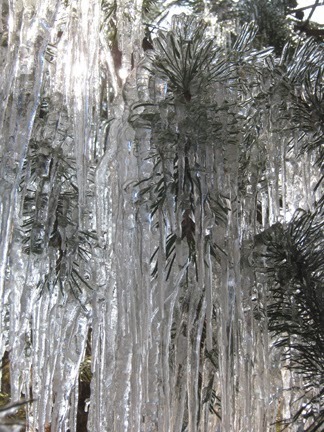 Metal icicles brings back memories, as mom always had them on the Christmas tree. It was fascinating watching them sparkle. I think my favorite winter scene is the frost covering tree branches or the pure snow sparkling in a clear/moonlit night. I love the first snowfall of winter. It's always so magical, especially if I can stay snuggled up inside. We had a snow/ice storm last night. Got up this morning and everything was covered. Looked beautiful on the trees. Fortunately, the road crews were out early! I love the fact that we have blue skies to go with the snow here in Alberta. I was out on the roads yesterday as the sun was starting to set and it was like being in a picture postcard it was so beautiful! Mary - I can see the clear winter night in my mind's eye! I loved it when I lived in the country on nights like that... it always seemed so quiet and peaceful. Mae - I agree the first snow fall is special! Suddenly the world is so clean and pristine. Unified in white. Diana - You are right! The big blue skies are what I missed the most when I lived in Ontario. And, in winter, they are beautiful set against the white landscape.